This weekend Silverstone will host Sebastian Vettel, Jenson Button and Lewis Hamilton and the British round of the FIA Formula 1 World Championship. 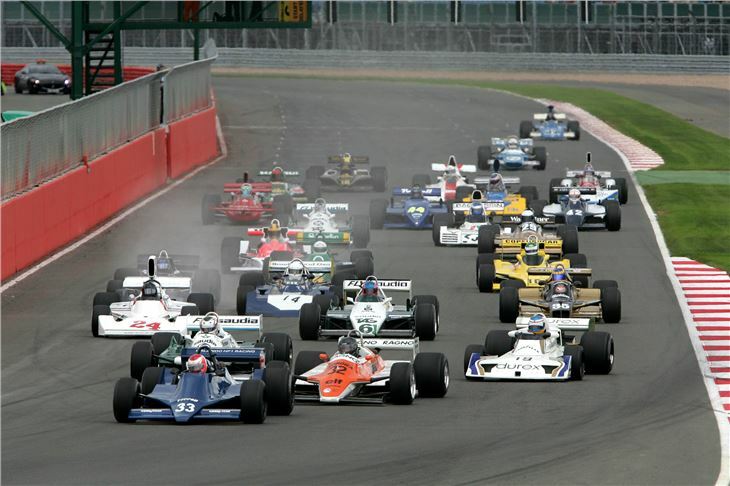 But just two weeks later, more than 100 Grand Prix cars from six decades of motor racing history will deliver a fabulous spectacle at the Silverstone Classic on the 22-24 July. The 2011 Silverstone Classic will be the biggest gathering of Grand Prix cars ever seen, yet this is no static display as around 110 cars will be in fast and furious race action in six of the weekend’s 22 races. 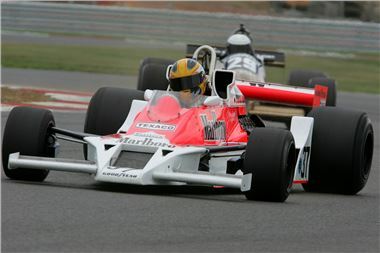 A magnificent 32-car field for the Silverstone Classic Trophy for Grand Prix Masters will re-live the halcyon days of the 1970s and early 1980s of the Cosworth DFV engine era. Produced in nearby Northampton, the DFV revolutionised motor racing at the end of the 1960s and made Grand Prix racing accessible to a host of new teams. These are the iconic cars raced by World Champions such as Jackie Stewart, Nigel Mansell, James Hunt, Niki Lauda, Mario Andretti and Emerson Fittipaldi. This was also the era when sponsorship truly arrived in Formula 1 and stirring the memories every car on the Silverstone grid runs in period livery of sponsors like Yardley, Marlboro and John Player Special. Every car on the grid has a history, and some of the key cars are the ex-Mansell Lotus 92 (raced by Roger Wills), the ex-Andretti Lotus 79 (Chris Locke) and the ex-Fittipaldi McLaren M23 (Richard Meins). 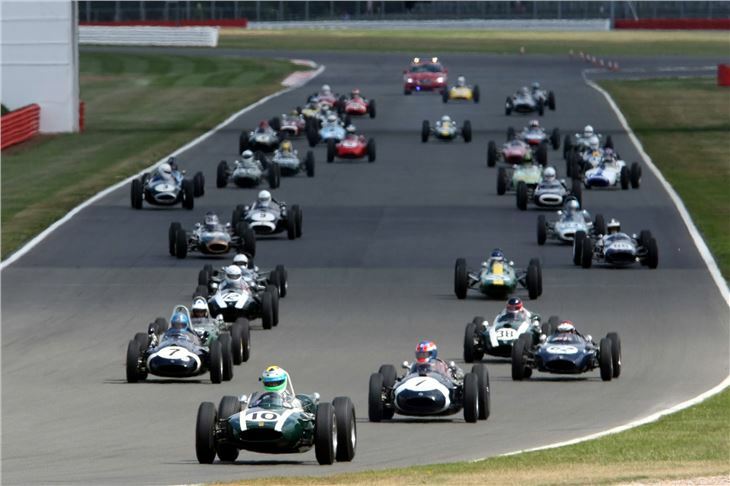 Stepping back a generation from the DFV-powered cars will be nearly 50 cars in the Silverstone Classic Trophy for HGPCA Pre-1966 Rear Engine Grand Prix Cars. These fabulous machines come from the time following the rear-engined revolution when Cooper and Lotus turned racing car design on its head and put the engines in the back of the cars. 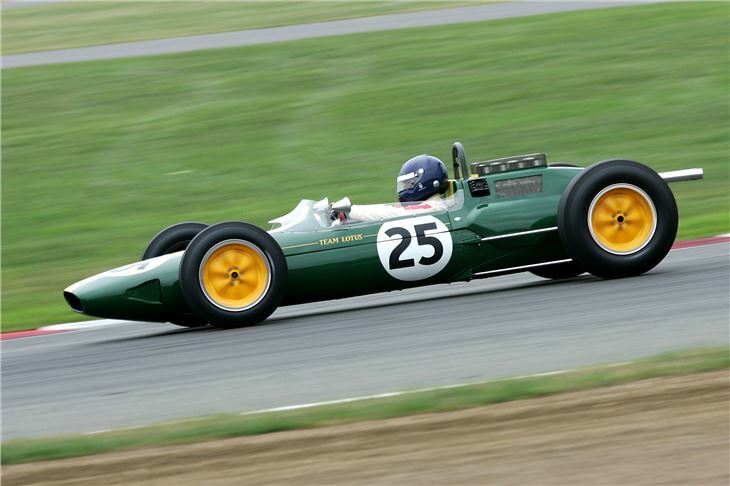 This was the era of Jim Clark, Graham Hill and John Surtees and one of the star cars racing at the Silverstone Classic is the Lotus 25 that Clark used to dominate the 1963 World Championship. Nearly 50 years later this famous car is still racing and will be driven by former touring car racer Andy Middlehurst, a self-confessed Clark fan. The Lotus 21 that brought Colin Chapman’s team its first Grand Prix win is raced by another Lotus aficionado, Dan Collins. The earlier 18 was the car that started the rear-engined era for Lotus and famous examples include those raced by Sir John Chisholm (ex-Jim Clark) and Paul Smeeth (ex-John Surtees). Meanwhile, the sensational engine note of the 1500cc V8 Climax engine in Mark Piercy’s ex-John Surtees Lola Mk4 will be a real treat for race fans. 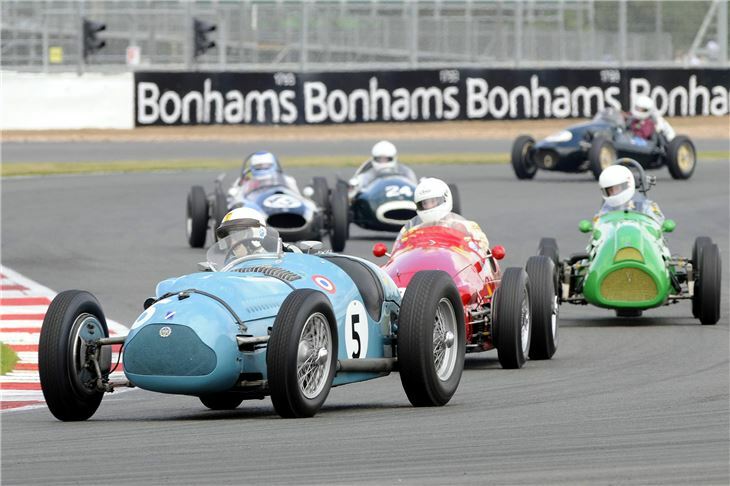 Another sensational field will contest the Silverstone Classic Trophy for HGPCA Pre-1961 Front Engine GP Cars. These cars, in some cases dating back to the 1930s, herald the early days of Silverstone and cover the era when Ferrari scored its first Grand Prix win, 60 years ago at Silverstone on 14 July 1951. One of the most glorious cars in action all weekend will be the Ferrari Dino of Tony Smith, the car that Phil Hill used to score the final Grand Prix victory for a front-engined car at Monza in 1960. The Ferrari will be challenged by the nimble front-engined Lotus 16s and the rare Scarab from North America. Notably, the Scarab to be driven by Julian Bronson will be racing for the first time in nearly 50 years. Aston Martin, BRM, Maserati, Cooper, Talbot, Alta and Gordini are all represented, while the magnificent ERAs from the 1930s represent the time when the small British manufacturer took on the might of German technology. Mac Hulbert and Mark Gillies will battle against the best of the 1950s cars in their ERAs, while the car of Charles McCabe is the ERA that racing journalist John Bolster famously flipped over at Silverstone in the 1949 British Grand Prix.